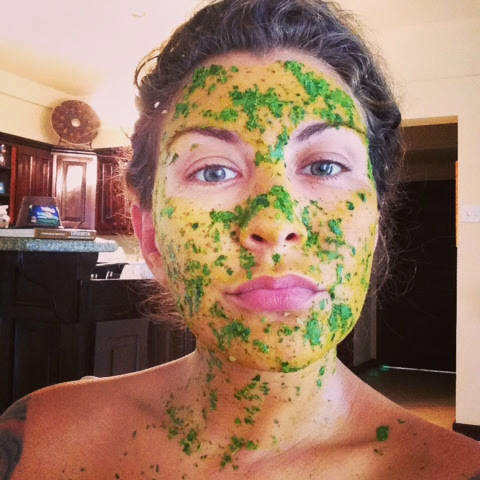 Neem Leaf and Turmeric Mask. All I did was throw a bunch of neem leaves into the blender with about a quarter of a cup of the neem water that I had boiled up and cooled, and tried to get it mashed up as much as possible. 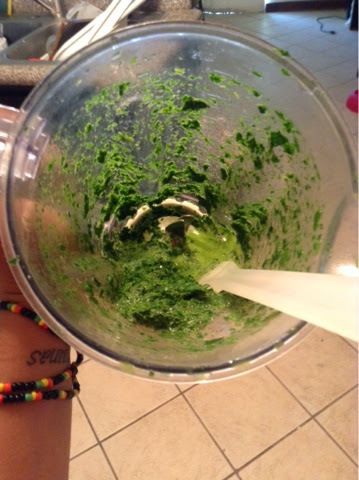 I would have used coconut water if I had had any, and I think that if I had a better blender the mixture would've come out, hopefully, as more of a paste than just chopped up leaves - but whatever - ya have to work with what you have, amIright? So... why would anyone even want a neem and turmeric face mask? Because neem is awesome for skin care - it helps shrink pores and pimples, lightens scars and skin discolorations, and gives an overall softness and brightness to you skin when combined with the turmeric. Why do you want a coffee and sugar body scrub? Because the caffeine in the coffee grinds reduces the appearance of cellulite. This is a great treatment to do at night so the coconut oil has time to soak into your skin instead of getting sweated off of you or rubbed off by all your clothes. Just a suggestion. I would have used local cocoa if I had any, but this is labeled as pure cocoa, and it was sold at the store closest to my house. Mix all of the ingredients, apply to your face and neck, and wash off with warm water once it dries. Why is this good for your skin? Sour cream is a form of lactic acid that hydrates the skin as it exfoliates; honey is a humectant that also boost hydration; the protein in the egg firms the skin; and the cocoa is packed with antioxidants. If I had yogurt in the house, I just would have mixed some of that with the cocoa powder and used that mixture instead, but my skin feels so soft right now, and the mask smells soooo freakin good. I'm starting to wonder if I should add "all nature skin care" in addition to my massage services in San Pedro - what do you think? I have coffee grinds, brown sugar and coconut oil. It's going down tonight!